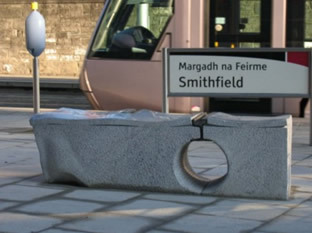 In 2004 James was commissioned by the Railway Procurement Agency to make a piece of sculpture for the plaza at Smithfield Luas stop on the Red Line. 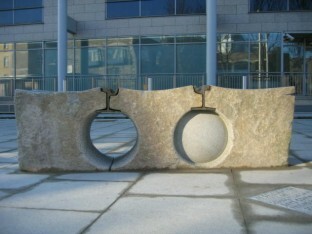 The brief was to create a sculpture that celebrated the life of one of their workers who died tragically at a young age. Location: Phoenix Street Luas Stop, Smithfield, Dublin. Dimensions: 200cm. x 60cm. x 60cm. Commissioning body: Railway Procurement Agency. I have attempted to reflect aspects of this young mans life and work in this piece of sculpture. The two circles represent the motorbike he rode, the lifting and peeling back of the surface to fit the tramline, the wrecking ball stopped, the rail line which he worked on. 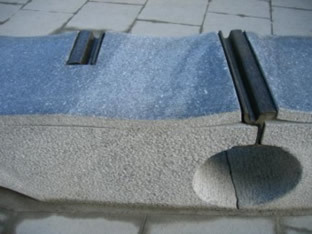 We decided to locate the piece back from the tramway and flank it with trees to create a place of rest and reflection in a busy city. Special thanks to Tony Williams, Tom Gallagher and staff at RPA and Albert and the lads at Mc Cluskey's.